What is the required standard? There isn’t one. Some players are really excellent, but others have only modest talent or training. What sort of piece should I play? Choose pieces you enjoy and can play quite well. — any style. On average each member has 5 or 6 minutes, so one or two short pieces is usually fine. A few members play longer works, but only if there is time for everyone else who wants to play to do so. Do I have to play at every session? No. Some new members just listen for the first couple of meetings. Only play when you feel you have prepared a piece and are happy to share it. At the meeting you volunteer when you want to play — there is no pre-arranged order, and no one knows what will be played until they hear it live. I’ve just started the piano — is Alberti for me? If you like what you have read about us, the answer is ‘Probably Yes’. Come along one Wednesday and see. Does it matter if I make mistakes in playing? Of course not — we all do! Naturally we practise beforehand and try to play to our best. But sometimes nerves or memory get the better of us. With difficult pieces members explain that we are hearing a ‘work in progress’. What is the background to the group? We started in 1983 as a weekly piano class for adults. We met in a studio overlooking Albert Square, which is where the group’s name comes from. Do you give piano lessons? No. But you will learn a lot if you come along. You will listen carefully to other players, join in brief comments on each piece just played, and chat to other players over tea/coffee afterwards. Importantly, you will gain experience in preparing a piece and playing to other people, and that will build your confidence. Do you give concerts? Several of our members do perform in public, and our members have participated in recitals, but the group itself doesn’t organize concerts. 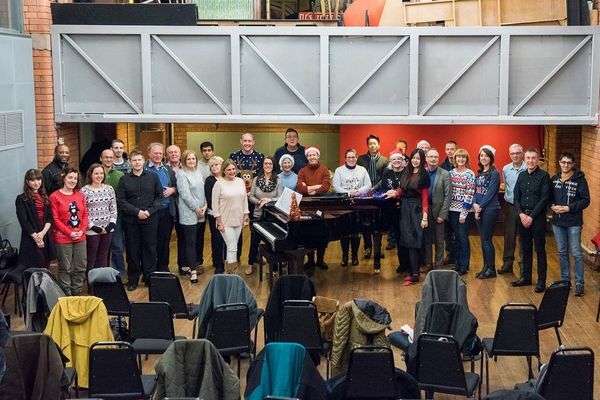 Do you organise concerts by professional recitalists? No. We simply play to each other and do not hire in concert performers — though Steven Hough and Peter Donohoe are always welcome as new members! Is it a venue for new contemporary music? There are no restrictions on the style or vintage of what you play. Some members do occasionally play their own compositions, arrangements or jazz improvisations. Is it only piano? I often accompany a singer / violinist / clarinetist /… The group focuses on piano solo and 4-handed duets on one piano. We do welcome the occasional piece in which the piano accompanies another instrument — viola, ‘cello, clarinet or recorder so far. I am in full time work — are there evening meetings? Sorry, no. We recognise that Alberti best suits part time workers, retired people and those who are flexibly self employed. Several members come from many miles away — return train journeys late in the evening would be a deterrent. What about weekends? In recent years, we’ve held Sunday meetings at the RNCM in August and plan the same this year, on 5 and 19 Aug 2018.